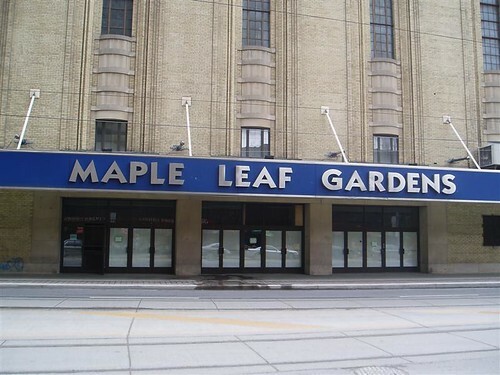 I have fantastic memories of attending Maple Leaf games at Maple Leaf Gardens. As a kid in the 1980s, I'd get to one or two games a year, usually against bottom-feeding Norris Division teams, where's I'd sit in the Greys and cheer like hell. I loved that old barn, so I'm glad they're bringing it back to life. A $60-million partnership between Ryerson University, Loblaws and the federal government will bring Maple Leaf Gardens in Toronto "back to life." On Tuesday the federal government announced a $20-million contribution from its infrastructure fund to get construction started. Another $20 million will come from Ryerson students, while the final $20 million will be raised in partnership with Loblaw Cos. Ltd.
"We're bringing Maple Leaf Gardens back to life," university president Sheldon Levy told a morning news conference announcing the renewal project. The iconic building at the corner of Church and Carlton streets will become a multi-purpose facility. Part of the building will be a Loblaws supermarket, while other parts will be turned into an athletic centre for the university. "This new centre will be a 150,000-square-foot space for Ryerson students and the public to use," said federal Finance Minister Jim Flaherty. "Once completed it will include an NHL-sized skating rink, a running track, basketball and volleyball courts, a fitness centre and more." I can't wait to take my kids skating at MLG. I was there for the last game. We were broadcasting from just inside the doors off Carlton street on February 13, 1999. Weston family copped a good deal, 2/3rds government money, 1/3 private sector. 60 million will just be the start of this money pit. Hell the ice rink is going to be on the 3rd floor. I was excited by the news, too. Well, until I saw the rendering with the Loblaws banners all around... then it just looked... I dunno... wrong. Will they be able to bring the smell of MLG back???? For me it was all about the first inhale when you entered the gardens and hit your escalator. I have a plaque with a photo of the last second of NHL hockey at MLG.